Product #46528 | SKU 851072 | 0.0 (no ratings yet) Thanks for your rating! 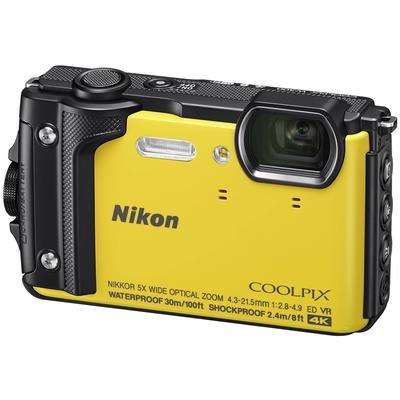 Characterised by its tough exterior, the yellow Nikon COOLPIX W300 is a sleek point-and-shoot featuring a reinforced physical design, along with apt multimedia imaging capabilities. Designed for adventures, and even everyday mishaps, the camera is waterproof-rated for depths up to 100' as well as shockproof for falls from up to 7.9' high and freezeproof for temperatures down to 14°F. In regard to imaging, a high-resolution 16MP BSI CMOS sensor benefits both stills shooting as well as video recording, with the ability to shoot continuously up to 7 fps, record video at UHD 4K/30p, and produce low noise imagery with a sensitivity range of ISO 100-6400. A 5x optical zoom lens spans wide-angle to telephoto focal lengths, and Vibration Reduction helps to minimise the appearance of camera shake for sharper handheld imagery. Additionally, the W300 also incorporates SnapBridge wireless connectivity, which uses Bluetooth and Wi-Fi for seamlessly sharing imagery and remotely controlling the camera from a linked device. Built-in GPS is also available for geotagging your imagery in-camera. Spanning wide-angle to telephoto focal lengths, the 5x optical zoom lens covers a 24-120mm equivalent range to suit photographing a wide array of subject types. Benefitting the lens's reach, optical VR (Vibration Reduction) helps to minimise the appearance of camera shake when shooting handheld, and Electronic VR is available to help steady movie footage while moving. Creative Mode and Special Effects let you creatively adjust the look of your image in-camera, including the ability to mimic a fisheye lens, miniaturise the scene, or affect the dynamic range or saturation. Smart Portrait Mode and Glamour Retouch can be used to optimise your portraits using seven enhancement effects, along with 12 retouch functions, such as teeth whitening and skin softening, to produce the perfect portrait. Language support: Arabic, Bulgarian, Chinese (Simplified and Traditional), Czech, Danish, Dutch, English, Finnish, French, German, Greek, Hindi, Hungarian, Indonesian, Italian, Japanese, Korean, Norwegian, Persian, Polish, Portuguese (European and Brazilian), Romanian, Russian, Serbian, Spanish, Swedish, Thai, Turkish, Ukrainian.